"Oh hai. 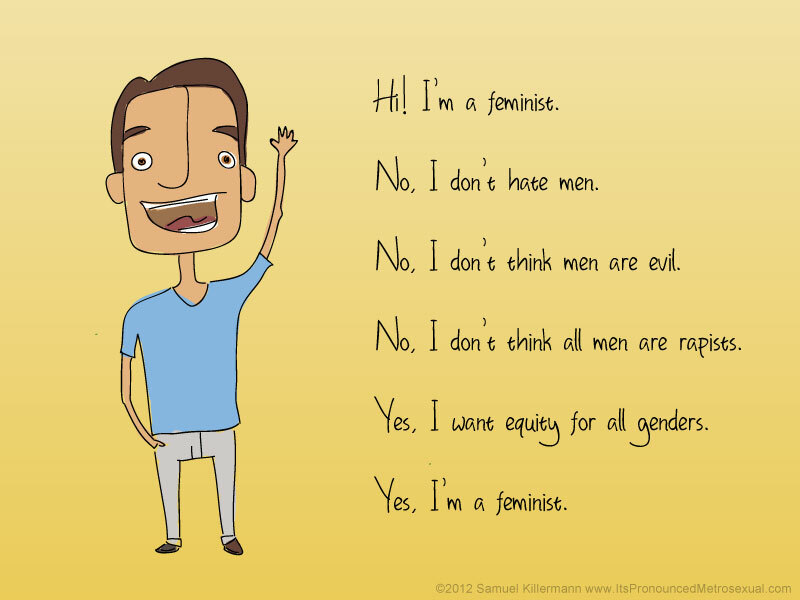 I is Feminist." This past week has been pretty interesting online: from discovering the dichotomy among feminists, to laughing my head off at Buzzfeed’s new list of funnies for internet feminists. Over the last week, I found a lot of women online insinuating that Karvachauth was anti-feminist. And that got me thinking. Are we becoming crazily antagonistic to men, ignoring the actual notion of equality that underlies true feminism? Ayuh, dis sounds about right! My understanding of feminism – (this may or may not be substantiated by academic theory, and I claim no expertise on my part to assert that my idea of feminism is the absolute truth) - is that it is a promoter of equality. Not absolute equality or the warped notion that a man = woman = man = woman. But rather, equality warts and all. Equality among equals, equality of respect and value, and equality of worth. To my mind, feminism is about seeking the empowerment of women, and by extension, of men. To my mind, empowerment is truly attained when a human being is sovereign over their mind and body, and the attainment of the state of understanding and acceptance that every individual’s mind and body is theirs only, and not for another to pass judgment on or impose upon unreasonable restraints, encroachments and demands. With that in place, it does not disturb me that there are women and girls who choose to veil themselves in different parts of the world of their own volition. With that in place, it does not disturb me that there are women who choose to fast for their husbands’ longevity from dawn until the moon appears in the night sky. Why? Because each of these women makes the choices they actively believe in, and endorse. And in doing so, they are entirely free and liberated. She made the choice, and she must (and will) deal with the consequences. Why brand her a scion of all things anti-feminist, when she is simply doing something of her own volition, something no one compels her to do, something she does because she wants to? The trouble creeps in when these things are imposed. Imposed veiling, imposed rituals, imposed obligations, imposed rules that a woman must be subservient to a man. For when there is an imposition, there is an encroachment of individuality. When there is an encroachment of individuality, there is an erosion of empowerment. When there is an erosion of empowerment, there is an absolute disregard for identity. And when identity is disregarded, as a natural corollary, dominance prevails. Oh hai. I is Feminist. that I do not believe in giving men the respect that is due to them. For me, feminism is not about denouncing everything by reading a sexist overtone into it when there is and should be none. For me, feminism is not about blindly parroting that “the woman is always right”. For me, feminism is not about taking down men and all things masculine. For me, feminism is about celebrating the differences that men and women bring to the table. It is about not just recognising those differences, but complementing them with each of our own contributions. Men and women are both valuable to society: one can’t survive without the other, and the entire human race will crumble in seconds if one is wiped out while the other remains. There is something that intricately links the survival of society and the acceptance of this truth. For me, feminism is about loving all the men as much as the women in my life for making it what it is. Telling you that I am a feminist feels great. It feels like a mug of steaming coffee early in the morning. Warm, fuzzy and home-like. PS: This post is dedicated to a very important friend/support-system/life you know who you are. :) "Thank you" is insufficient.